Finding the right shaver can be difficult. There are a lot of options out there and it can get a little overwhelming. 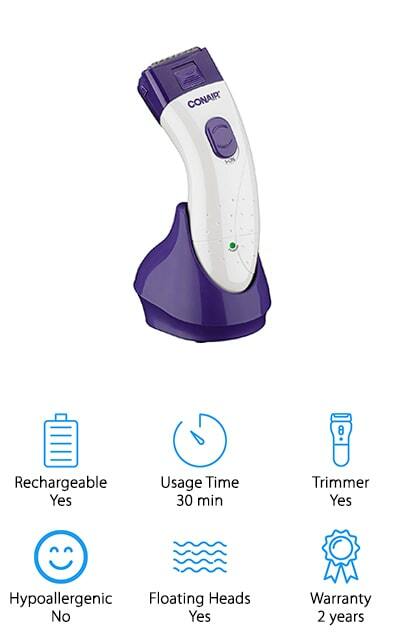 If you’re looking for something cordless that can do more than shave your legs, check out our electric razor for women reviews. We researched some of the top-rated products to help you find the right one for you. Before we get into our reviews, let’s take a closer look at some of the key features you should know. Rechargeable: Since all of these products are cordless, they all require a battery. Most of them are rechargeable but there are a few that are powered by regular AA batteries. There are good and bad things about both types. Usage Time: The shavers with rechargeable batteries tend to have more reliable usage times and they range from 30 to 70 minutes. Those that use AA batteries vary depending on the battery you use and how you’re using the shaver. 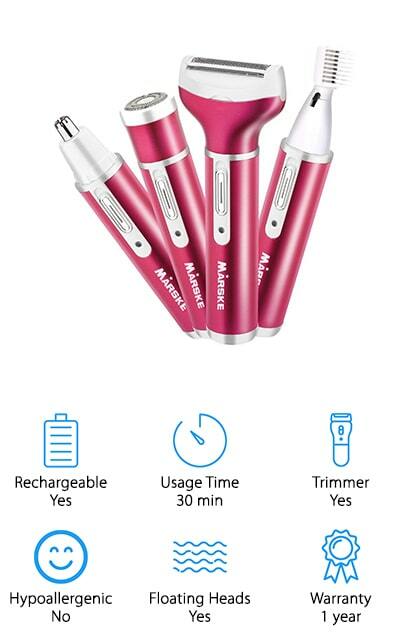 Trimmer: Some of these shavers have small trimmers that make it easier to get those small, delicate hairs and are especially useful for eyebrows, facial hair, and the bikini area. Some even have pop up trimmers, which are super convenient. Hypoallergenic: If you have sensitive skin or suffer from allergies, a hypoallergenic shaver is a great thing to have. It can prevent irritation and breakouts that could otherwise become a problem. We found a couple of great options for you. Floating Heads: Floating heads are one way to make sure you get a shaver that moves smoothly across your skin. Because they can pivot freely, floating heads follow the contours of your skin and help you avoid cuts and nicks. Warranty: All of these products are covered by some kind of warranty, though they vary significantly from 60 days to 2 years. Make sure you read the warranty information carefully so you know what’s covered, just in case. Now that you know a little more about what to look for, let’s move into our top ten products. If you’re in a hurry, start at the beginning. We put our top and budget products first because they give you a pretty good idea of the range that’s available. All of these are great products so stick around if you can, all of these products are great. So, what is the best electric razor for women? Let’s find out! Our top pick is also the best women's electric shaver for sensitive skin, the Remington Smooth Glide Pro. This shaver has an angled head with 4 blades that stay close to the skin. Plus, the dual-sided trimmer lifts the hair before it reaches the blades for a close, smooth shave. Not only is this shaver hypoallergenic, but it also has an antimicrobial coating to prevent irritation and breakouts. The almond oil strip moisturizes and nourishes so you can use this shaver with or without shaving gel. The shape is easy to hold onto and has soft-touch sides so it’s really comfortable to use. It is waterproof but works best if not submerged. This shaver includes a charging stand, bikini comb, head guard, and a small bag for easy storage and travel. Our budget pick is also the best women's electric shaver for bikini area we found in our research. The Panasonic Electric Shaver can be used wet or dry so you can use it to shave in the shower or for a quick touchup on your way out the door. The three floating blades are hypoallergenic to prevent irritation on even the most sensitive skin. Each moves independently so the head easily adjusts to the contours of your body so you don’t miss a thing. 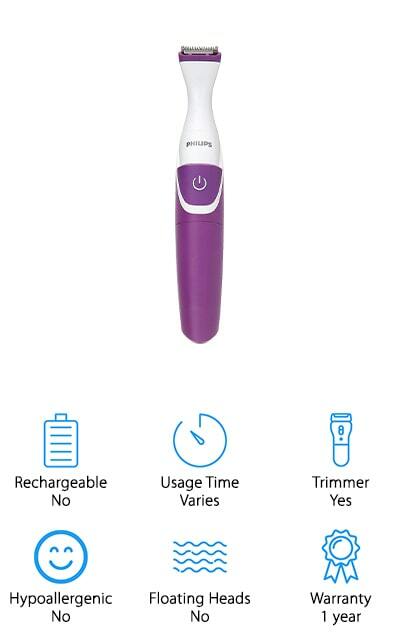 The pop-up trimmer is perfect for getting long hairs and shaving along your bikini line. That’s not all, this shaver comes with a really compact, space-saving charger that plugs directly into the outlet and doesn't require any counter space at all. There’s also a cleaning brush and travel pouch included. Next up is the Conair Satiny Smooth Shaver. It features dual independent floating blades that you can use either wet or dry for smooth results on your legs, armpits, or bikini area. One blade pops up so you can get close, precise control in sensitive areas and the other is designed for quickly shaving longer hair for a smoother shave. The ergonomic shape is comfortable to use and easy to control, even when you’re trying to get to those hard to reach areas. There’s more, the purple and white charging base looks nice enough to keep on your bathroom counter and the shaver itself includes an LED indicator light so you always know when it’s charging. It includes a cleaning brush to help you keep it looking good as new after every shave. 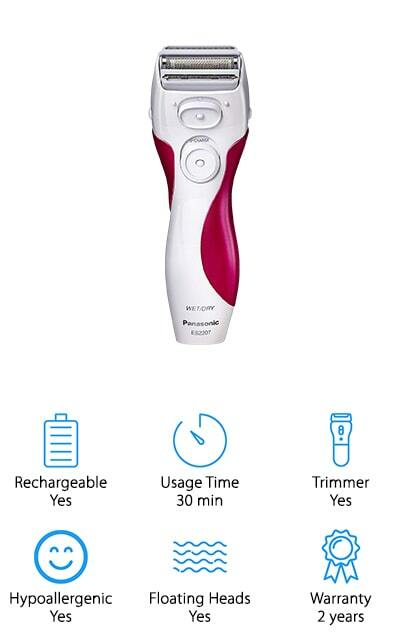 The Philips BikiniGenie Trimmer is unique because it has a small head and attachments that make it perfect for shaving the most sensitive areas practically eliminating nicks and cuts. You get a trimming comb of 3/5mm and a mini shaving head for a perfectly clean and close shave. You also get a convenient storage bag so you can take everything with you when traveling. This shaver can be used wet or dry so you can use it in the tub or do a quick touchup before heading to the beach or pool. It has a compact, easy to use shape that’s comfortable easy to control. 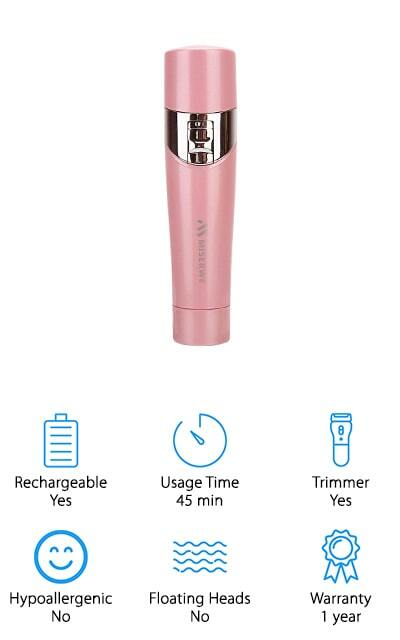 One of the most convenient things about this trimmer is that it runs on AA batteries so you don’t need to worry about taking a charger with you while traveling. 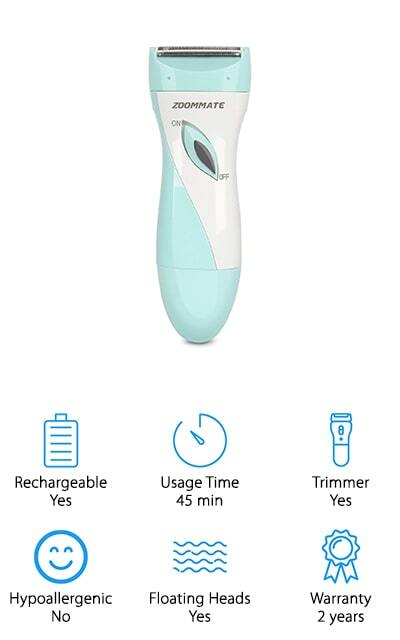 The Sminiker 4 in 1 Electric Razor is the best electric shaver for women's underarms and a whole lot more. Not only does it have a unique 3-in-1 blade that glides smoothly along your skin, but it’s also completely waterproof so you can use it in the tub or shower and submerge it without worrying and it’s really easy to keep clean. This shaver comes with several attachments including a precise shaving blade and trimming blade. It also features a popup trimmer to get unwanted stray hairs and a rotating facial scrubbing brush making it one of the most versatile shavers available. With a full charge, this shaver has a long runtime of 70 minutes. That’s not all, it also comes with a charging base and a cleaning brush. 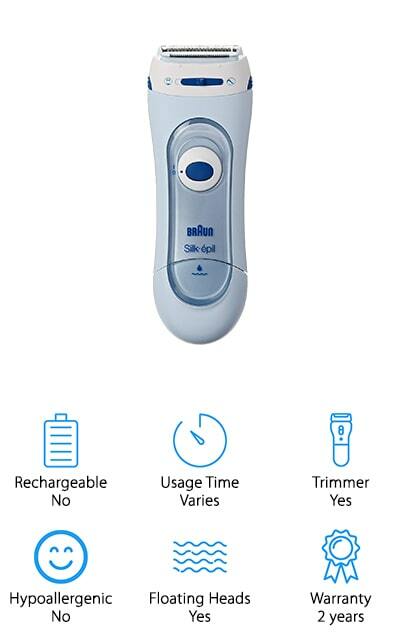 Our next pick for the best electric shaver for women's legs is the Braun Silk-épil Electric Shaver. One of the things that stands out the most about it is the unique exfoliating attachment that helps to stimulate and revitalize dry, dull skin leaving them feeling extra smooth. Plus, the floating foil and trimmer system gives you a close shave you’re looking for. The rounded head helps this shaver glide more smoothly, especially over your legs, knees, and ankles. You can use this one wet or dry and it’s a good choice for your underarms and bikini area, too. This one runs on AA batteries so runtime will vary depending on usage. If you want something that you can take on vacation or to the gym without worrying about hauling around a charger, this one is a great choice. 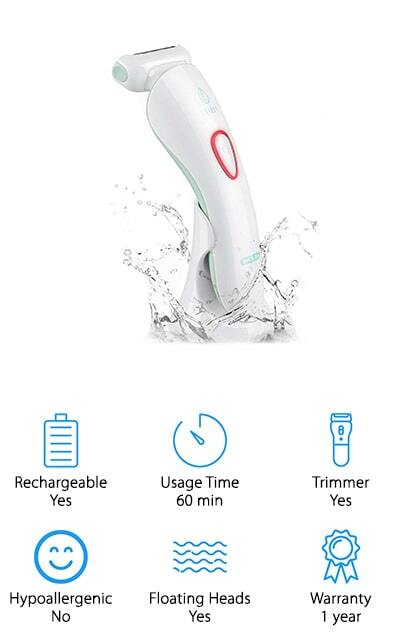 The Lavany Ladies Electric Shaver has an effective multi-purpose design that makes it perfect for shaving your legs, arms, underarms, and bikini line. It has both a straight blade and a curved blade as well as floating foil for a close shave without any cuts or nicks. The multi-flex head glides smoothly over your ankles and knees and the builtin light helps to make sure you don’t miss anything. This shaver can be used wet or dry and is completely waterproof so you can clean it under running water. That’s not all, it also has 2 different charging modes to choose from. Simply connect the charger directly to the shaver or place it in the charging stand. An indicator light lets you know when it’s charging and, once it’s completely ready, it runs for 1 hour. Next in our electric shaver for women reviews is the ZOOMMATE Ladies Electric Shaver. One of the coolest things about this one is that it charges using a USB cable. Why does that matter? It’s so convenient! You can take it with you traveling and charge it using an adapter, power bank, car charger, or even your laptop. Basically, whatever you use to charge your smartphone you can probably use to charge this shaver. 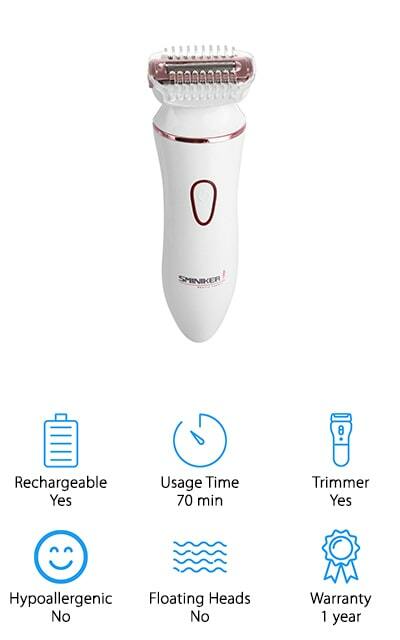 That’s not all, the 3-in-1 blade technology and high-speed motor work quickly and efficiently for thorough results leaving you with smooth, silky skin. This shaver is completely waterproof so you can use it in the shower or tub and even wash it off under running water. Plus, the shaver head is detachable for an even better clean. The best electric shaver for women's facial hair is the Miserwe 5 in 1 Electric Razor. This one comes with 5 different attachments making it extremely versatile. You get a bikini trimmer, facial hair trimmer, nose trimmer, body shaver, and facial brush. 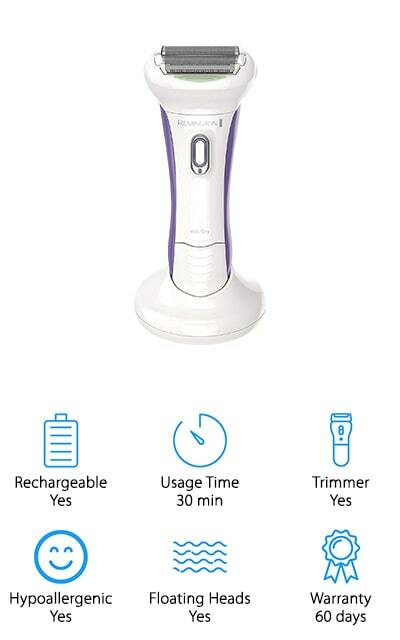 So, not only will this trimmer take care of facial hair, it’ll take care of your skin, too. Everything is water-resistant and you can use them all wet or dry. The blades are made of stainless steel so they’re really durable and keep their edge for a long time. That’s not all, the compact shape is just the right size so that you can toss in your purse or suitcase and take it with you anywhere. Charging is really easy, too. Just use the USB cord and any adapter. Last up is this shaving kit from Clever Bright. It comes with 4 different interchangeable heads: a body shaver, eyebrow shaper, nose trimmer, and bikini trimmer. Changing from one to another is really easy, too. That’s not all, you can also use each of them wet or dry so you can take your time in the shower or do a quick trim on your way out the door. The blade is super-thin and pivots smoothly so you get a close shave without any irritation. It doesn’t snag or pull, either. If you want something portable, this one is a great choice. It’s small enough to put in your purse or gym bag and perfect for travel. It charges with a USB cable so you can charge it anywhere you can charge your phone.